The graphics in Ragdoll Olympics are not bad. The character that you control is a little simplistic but still detailed enough to be interesting. The backgrounds are done nicely and all have a similar style instead of just being generic photographs of real-world places. The music in the game is fast-paced and manic. This adds to the gameplay in some areas. The sound effects are overdone. The voiceover saying the same words every time you fail gets annoying fast. The purpose of the game is to compete in a number of Olympic events attempting to win each one. The challenge is that your character on the screen is ragdoll that sits crumpled on the ground until you move it. Everything is controlled with the mouse. You click somewhere on the screen and then drag the mouse. A line goes from the original point you clicked to the current mouse position. Releasing the mouse button causes the ragdoll athlete to fly off in that direction. This is how you must maneuver through every event. Ragdoll Olympics includes a large number of events from the long jump and 100 meter hurdles to volleyball and wrestling. The gameplay for each event is slightly different keeping everything interesting. Some events you basically cannot lose such as diving because all you need to do is fall down. Other events like the hurdles are challenging because you need to think outside the box to win. It turns out that clicking and dragging while the ragdoll athlete is in the air will cause him to stay in the air and fly over obstacles. Using that technique can actually be incredibly hard especially on the longer levels where a single mistake or click outside the game window will spell your doom. There is not too much wrong with the game. A few of the challenges like volleyball are almost impossible to win through skill. You are relying on luck that the ball goes over the net. Other events do not have clearly defined rules at the start. One drawback is that there is no overall scoring or achievement system. This makes winning each event feel a little hollow. You just keep marching forward from one event to the next. 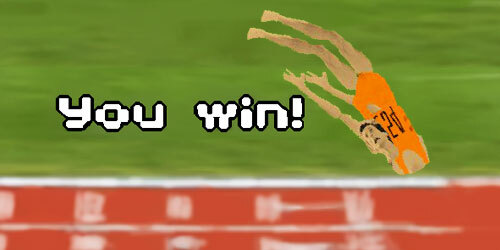 “Ragdoll Olympics” is a fun and challenging game that can be a little frustrating at times. Pingback: Ragdoll Olympics – Fun for about Two Minutes | We Are Super!